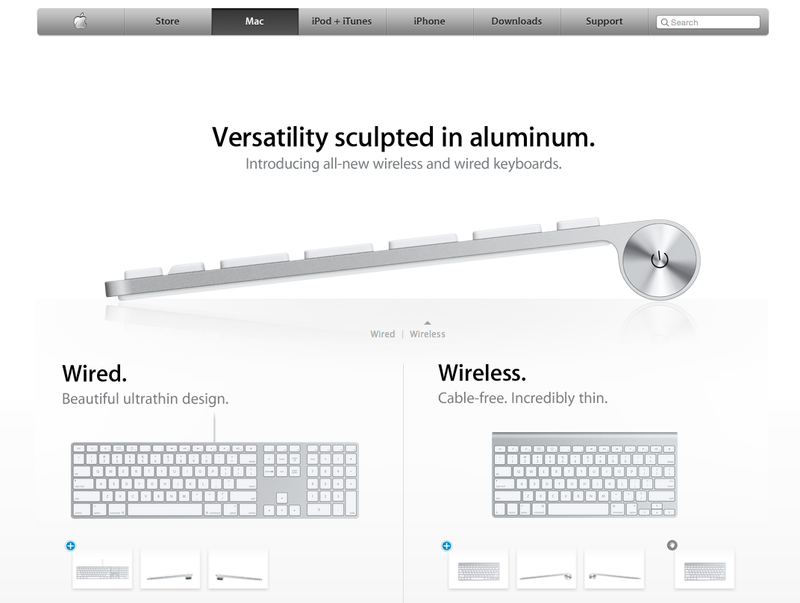 The Apple Wireless Keyboard as we know it today is a dinosaur in terms of technology products. It was first introduced alongside its larger, wired counterpart way back in 2007, not long after the first iPhone debuted, and the iPod, now removed, still reigned supreme in the navigation on Apple.com. In 2009, the wireless model was updated slightly to use one less battery, and a smaller wired keyboard was introduced. 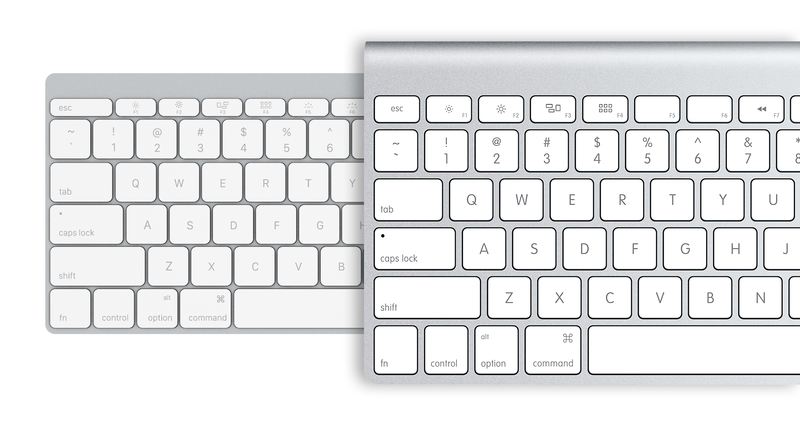 In 2011, two function keys received updated graphics to coincide with UI changes in the then new Mac OS X Lion. Aside from those tweaks, everything about the keyboard has remained the same for 8 long years. It’s safe to say that a refreshed design is in order. Let’s take a look at what’s changed since then. Macs no longer ship with optical disc drives. Yet every wireless keyboard still ships with an eject button in the upper right corner of the keyboard. This is no longer useful on newer Macs as software can control occasional uses with external SuperDrives, and makes absolutely no sense when paired with an iPad, another popular use of the keyboard. With the Apple Watch, Apple introduced the font San Francisco, an all new, custom typeface that has been making its way across the product lines, most recently as the keycap font for the new MacBook and coming soon Mac and iOS devices with iOS 9 and OS X El Capitan. The Apple Wireless Keyboard and MacBook Pro still use the older VAG Rounded font. Finally, along with the 12″ MacBook came the butterfly mechanism, an improvement to both the stability and space efficiency of individual key caps. This allows each individual key to be 40% thinner and 17% larger than on previous Apple keyboards. Naturally, this change should trickle down to the wireless keyboard. The FCC filing sketch for the new Apple keyboard appears to show a design that ditches the cylindrical AA battery compartment on the rear of the device, in favor of a flat, low profile design with four rubber feet, and a small power button on the top edge. While the final design could deviate from the drawing, this change would make sense. The flat profile would imply improved typing ergonomics similar to MacBooks, reducing upward bending of the wrist. Ditching the AA battery power source in favor of a rechargeable, internal battery could also play into Apple’s continued efforts towards environmental conservation, reducing the need for disposable batteries, and perhaps finally allowing the abandoned Apple Battery Charger to retire. Apple’s new found love for the Silver, Space Gray, and Gold trifecta of colors has permeated to almost all of their products, from the new MacBook, to Beats headphones, to the iPhone, iPad, and Apple Watch, all the way down to Apple gift cards. This new, colorful world would only be truly complete with keyboards to match. With an increased number of wireless keyboards being used with iOS devices, it would be fantastic to have matching finishes available across the line. Both white keys like are currently found on Apple’s keyboard and black caps like the ones found on MacBooks would work well, but Apple would likely choose one or the other. iOS devices in both silver and gold typically use white as their accent color. Below you can view galleries of how each color configuration could look. Which is your favorite?